Forgive me for my super late post. I hope some of you are still awake. I’ve been so busy these past few days I can barely find the time to blog. The result? Tons of backlog! Actually, these photos have been hidden away in my laptop for waaaaay too long. So no, I’m not in cropped tops everyday. It just so happens I’ve been posting a lot of them lately. But what’s wrong with cropped tops anyway? I plan to make the most out of this trend before they vanish! As you may have noticed, I almost always wear something over my cropped tops. These jackets, vests and cardigans are my security blankets. They come in handy whenever I feel a few judging eyes staring at me. 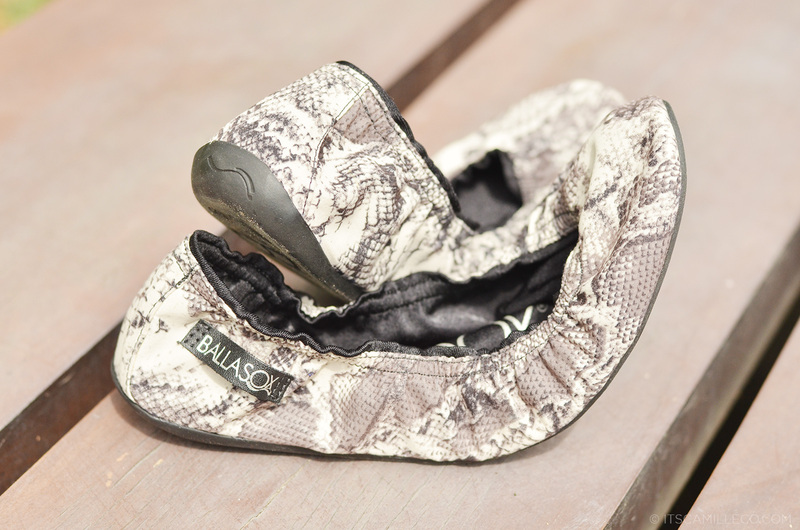 If you’re not into heels, check out this pair of Ballasox flats. They have the same snakeskin print as my Theory heels! Tada! They work with my outfit as well. The Theory heels you’re wearing are magnificent ! They look gorgeous on your feet, Camille ! Especially with the color you choose to polish your toe nails ! Absolutely stunning ! Hi Camille! I recently got a black printed flowing shorts from Zara too because they look so comfy and cute, but i’m not so sure what top or blouse would go with it aside from the cropped top you wore here. I love your bag! I love your bag! I LOVE your bag!!! Your entire outfit is uh-MAY-zing! I usually don’t comment and am usually a silent stalker, but i absolutely adore your style and you are truly inspiring. You are dragging me into the world of fashion just by your sheer amazing fashion power. wished that all ninjas looks like you..haha..
i really love this look!!! i love how you are wearing a cropped top, but still look professional.. and those heels are so pretty.. the ballasox is also coool, since its stylish and comfy at the same time.. Thanks Christine! :) LOL! My shorts do look comfy! Hi, Miss Camille! I got a kick out of your Star Wars reference! Cool way to express your choice of outfit here. Despite the very edgy looks these pieces have, I admire how you chose them in feminine silhouettes and fabrics. The white cover-up (kimono?) is stylish in its clean, oriental look. Both shoe choices you have here are to die for! Your heels remind me of a certain shoe I saw in an action movie, and your Ballsox flats are out of this world! They certainly make a statement. I’d really like to say that I can imagine you in an X-Men movie with this outfit. You exude a powerful form of femininity in white. LOL! That would be so cool! Xmen!! :) Thank you Angelic! If that is how a true ninja will be look like, I will not feel creepy or freak out if I will ever see one. Lalapitan ko pa and ask, “sinong fashion inspiration mo?” Hehehe. Hahaha! :) Thanks Lourine! But they might not be able to fight well LOL! You better start blogging your Macau trip before you go to KL so it won’t add up pa sa backlogs mo and besides I’m excited not just your outfit shots but also your adventure there! It’s been 2 years since I went there :) I love their ala-Vegas city lights! Yes during summer! :) It was so so hot then :) And yes, blogging about my Macau trip soon! LOL! Tulog haha! :) Thanks Nicole! Long legged Cams! You look like a beauty queen! Parang I don’t have any blue skater skirts :) Haha! OMG I want that leather kimono!!! But I can’t find it on the website though :( is it still available? or can you sell it to me? LOL. Love that leather kimono :D I’d wear that with some kind of Harajuku print :D I also love how your accessories are Star Wars-y too :)) I might die if I wore leather in the Phiippines, fashion trooper indeed! I’m a dedicated fashion trooper! :) Thanks Marnelli! I LOVE YOUUUUUUUUUUUUUUUUUUUUUUUUUUUUUUUUUUUUUU. :* best fashion blog ever. I wouldn’t mind seeing you in cropped tops! With that flawless skin? Nobody should even dare judge you! I’m not that blessed as well though! Thanks johanna! GAWD! This is to die for! I really love this Ms. :))))) Kabog! It can work! Mix a number of them para mukhang sadya :) Thanks Kathleen! Cropped tops are so in nowadays and we see them worn by many bloggers. I just wonder where you can wear those cropped tops in the Philippines, especially in Manila. I mean yup they look cute and nice, but people would be staring at you in public places. Wouldn’t it be too uncomfortable? Love your outfit to bits, you are such a doll! Haha! Thanks Sephie! :) Yay! Natawa ka! And there’s another reason why you’re my favorite local fashion blogger! Your style is outstanding amongst all! Di ko keri ang shorts na yan! So nipis! They will get soaking wet in no time (no pun intended). haha! I agree! I wish they would last forever or until I get too old or fat that I won’t be able to wear them anymore LOL!